Tired of the Google two-step—that tiresome toggling between a long list of search results and the corresponding Web sites? It may be better to first open up all the sites in their own tabs and then browse them. In Safari, the easiest way to do so is to first make sure you’ve enabled Tabbed Browsing: in Safari’s preferences, click on the Tabs icon and select the Enable Tabbed Browsing option. Once you’ve done that, hold down the Command key when you click on any link you want to open; the page will appear in its own new tab, with the Google results page still in the foreground. (You can press Command-shift and click on the link if you want it to appear in the foreground.) Once you’ve opened all the results you want, press Command-shift-left arrow or -right arrow to navigate through the tabs. When you know you’ll need to go back to a specific page repeatedly for a couple of days but never again thereafter, don’t add it to your list of bookmarks, where it’ll stay until the end of time. Put it on the Bookmarks Bar instead. To do so, just drag the URL from the address box to the Bookmarks Bar. Give the resulting bookmark a name and click on OK. From then on, a single click will take you to that page. When you don’t need the bookmark anymore, just drag it up and off of the bar, and it’ll disappear in a puff of smoke. If you want to find out more about something you see on a Web page, you can do a quick Google search on it by selecting the phrase, holding down the control key, clicking on the text, and then selecting Google Search from the resulting menu. Safari will jump to Google and return search results for the phrase (See “Controlled search”). Note that this won’t work on link text. Stash the cash : Safari Enhancer lets you turn off caching, which may display Web pages faster over a broadband connection. If you have lots of bookmarks, you know how much of a headache it can be to scroll through your Bookmarks menu to find the one you want. 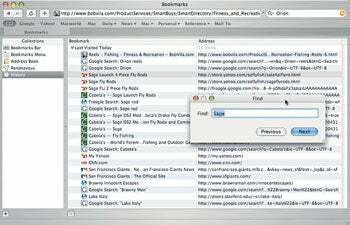 Save yourself time by keeping your bookmarks in order. Jerry Krinock’s SafariSorter (free, donations accepted) will sort your bookmarks alphabetically; it’ll also weed out duplicate bookmarks and make the menu more manageable. Each time you add a bunch of new bookmarks, run it again. A couple of seconds once in a while will save you plenty of time in the long run. If you’ve ever used a browser other than Safari, you probably have two different sets of bookmarks on your sys-tem. Safari automatically imports bookmarks from other browsers the first time you run it, but after that you’ll need a third-party application such as Gordon Byrnes’s Safari Enhancer (free, donations accepted), which lets you import bookmarks from other browsers or from a flat HTML file. 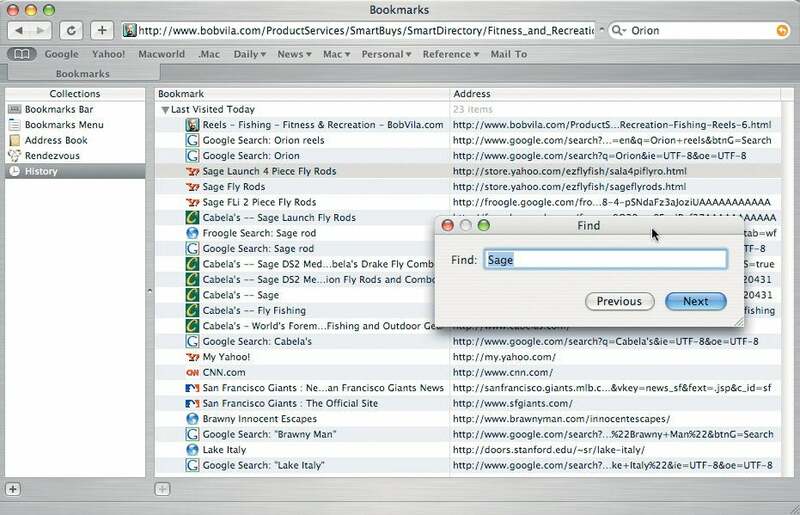 After you’ve corralled all your bookmarks, use an app such as SafariSorter to get rid of the duplicates. The cache is useful for dial-up connections (it stores previously viewed pages, letting you skip a new download). But Safari may actually display pages faster over a broadband connection if you turn the cache off. Instead of wasting time searching for previously viewed pages and images on your hard disk, Safari just downloads everything. You can also speed up browsing by deleting the cache of favicons (those tiny icons that many Web sites display in front of their URLs in the address box). 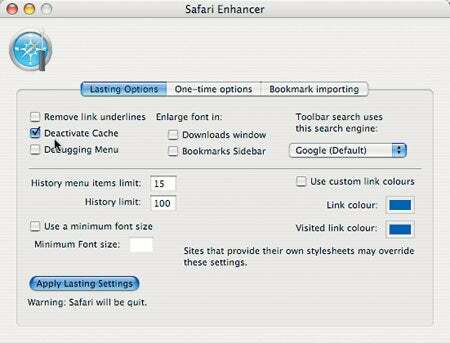 Safari Enhancer can do both. 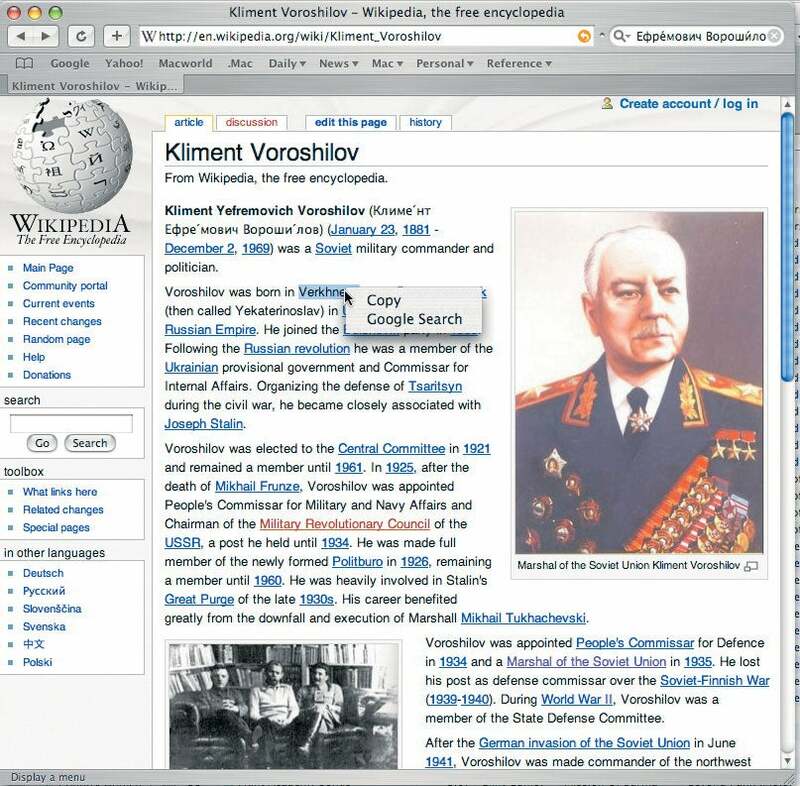 You probably know that you can use the History list to find pages you’ve viewed recently. But to make using the History list easier, don’t just scan it. Search it. Press Command-option-B to display the Bookmarks window; then click on History in the Collections list. Press Command-F and type a word you think is in the title or URL of the page you’re looking for. Press return to go to the first page with that word, and press Command-G to go to the next. Once you’ve found the page you’re looking for, just double-click on it to view it again (See “Historical search”).